We have just wrapped up a two week visit with Judith and Haakon, Island Packet 380 TOUCHE owners, who flew into Fort Lauderdale, Florida and presented Arctic Sailing seminars at the Miami boat show and the Coconut Grove Sailing Club. We have been planning and anticipating their visit for months. When special events like this arrive, they seem to happen so fast and before you know it, the fun is over! We are sad to see this time end, but the amazing aspect is all events and activities turned out to be better than planned. We really enjoyed getting to know Judith and Haakon and we appreciate their effort and expense of flying here from Copenhagen Denmark. Their seminars were about the two months they spent last summer far above the Arctic Circle as they explored the island of Svalbard. They reached the northern latitude of 80 degrees. After swimming with icebergs and photographing polar bears, beluga whales, puffins, geese, arctic fox, walruses, and beautiful fjords and icebergs, they sailed south to the northern tip of Norway. Tue Feb 17, Day off, Sailing on IP380 PRIORITY, thank you, Reuben! Sun Feb 22, Boat Buddy SP CATSPAW Carey boards for a day of sailing, Brunch with IP380 PRIORITY, Reuben and Molli and Dinner with IP380 SHAWNEE, Drew and Deb. Wed Feb 25, Casual Breakfast onboard, Drive to Ft. Lauderdale, West Marine shopping, take a New River boat tour of yachts and homes, Lunch with IP38 MOONDANCE, Bob and Nina, coffee and treats at Cheesecake Factory, Flight out at 2200, we Uber Car back to CGSC. What a fantastic two weeks. We really packed in a lot of activities, days of sailing and boat show and even a WallCast. We love when a plan comes together and when it is even better than expected! Happy smiles after the seminar. Seminar #4 complete! Chocolate Wine and Russell Stover Candy! Thank you again Judith and Haakon for flying to Florida and sharing your adventures! Next up….Prepare for the BAHAMAS trip….here we go. ..Island Spirit at Coconut Grove..
We have moved from Harbour Cay Club, in Marathon, FL, up north to Coconut Grove Sailing Club in the Miami area on beautiful Biscayne Bay. We were so very lucky when we arrived in the harbor! A mooring owner had just left for two months, opening up a front row mooring, number A-12 and we were able to take it immediately. This is unreal, lucky us! We wanted to be based here in the CGSC mooring field because our friends and Island Packet Yacht owners from Denmark, Judith and Haakon, will be here Feb 11-25, 2015. Basing here, we can easily come and go to shore using the club’s 24/7 launch service. We also decided to join the club as a non Florida resident since this club has been so helpful and kind in setting up the seminar that Judith and Haakon are presenting on Feb 18 at 7pm. These adventurous sailors sailed north from to the Island of Svalbard, far above the Arctic circle. They spent July and August last summer as far as 80 degrees north. The sun never sets all summer long above the circle! They also jumped off their boat to swim with icebergs. OMG, that is crazy. They saw polar bears, walruses, puffins and more. What turned out to be an invite to come over and spend a couple of weeks in Miami has grown into three Miami Boat Show presentation and one Sailing Club presentation sponsored in part by Ed and Debbie Whiteaker of Whiteaker Yacht Sales. THANK YOU! 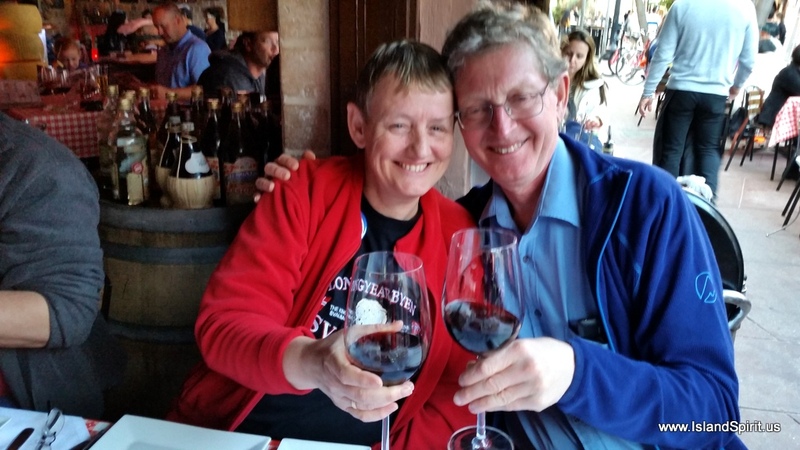 Judith and Haakon are the latest super stars among our Island Packet Fleet and we look forward to hosting them. What do we like about the Coconut Grove Area? WOW, what is there not to like? We love the beautiful waterfront with palm trees and walkways for miles along the water. 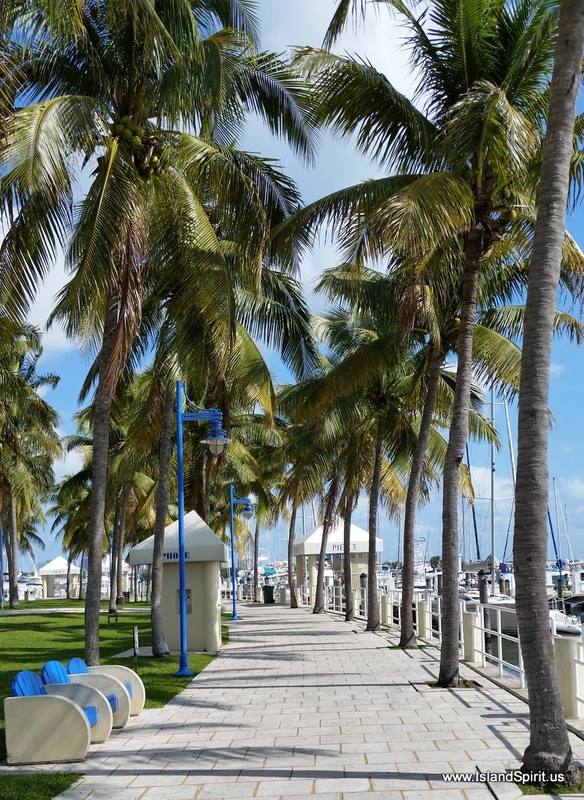 These walkways lead into city parks with rubberized trails and boardwalks along Biscayne Bay. Coconut Grove has a town center, half a mile up the hill from the harbor, where you will find pubs, restaurants, Starbucks Coffee shop, surf shops, movie theaters and much more. We go for 4 mile walk every day. First, we ride the launch into the docks and then hit the parks and trails, usually taking a coffee break along the return route. We really like spending time in the Coconut Grove area. The CGSC has a club bar and a cafe where they have taco night on Tuesdays for $5, fajitas on Wednesdays for $13, and live bands usually on Friday night. The bar has a happy hour every week night with 2 for 1 drinks. All this is only open to club members. The club also hosts world class sailing events and sailing classes open to the public. Last week it was the RsX world cup and this weekend the Melges 20 Audi Cup is here. We have bumped into several Olympic sailors and have seen sailors from all over the world. This is THE sailing club in Florida. Here are some photos of the area. We plan to be here until the beginning of March when we will look for a weather window to sail to the Bahamas and into the Abacos. Sail along….